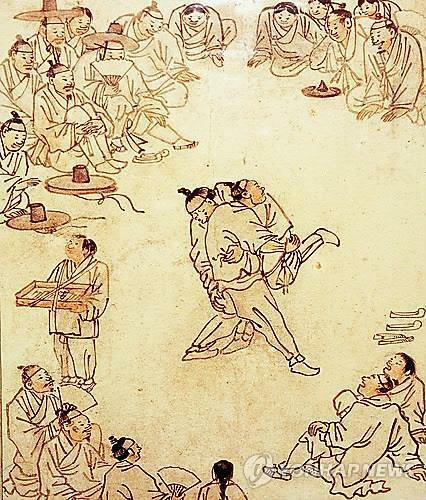 Korean authorities are closing in on their bid to include ssireum, a traditional form of wrestling, on the UNESCO list of intangible cultural assets, as the evaluation body of the UNESCO recommended its inscription. According to the Cultural Heritage Administration, the assessment panel of the international body recommended the inscription for 29 of the 40 applicants, including ssireum. Whether Korean wrestling will be included in the list will be confirmed after a deliberation at the 13th session of the Intergovernmental Committee for the Safeguarding of the Intangible Cultural Heritage, slated for Nov. 26-Dec. 1 in Port Louis, Mauritius. If ssireum is inscribed, it will bring the number of South Korean intangible assets on the UNESCO list to 20. The latest application for Seoul coincides with North Korea’s separate application for ssireum. South Korean authorities have been seeking to merge the two Koreas’ bids. “I’ve suggested to the North that South and North Koreas should jointly apply for ssireum’s application for the intangible cultural heritage, to which they responded in a positive manner,” the CHA chief Chung Jae-suk had said during her recent meeting with local reporters. The CHA officials said further discussion between Seoul, Pyongyang and the UNESCO is in order to hammer out the details. Ssireum is a sport that dates back to the Three Kingdom’s era (52 BC-AD 680) of Goguryeo, Silla and Baekje. Ssireum is still practised in Korea, with wrestlers competing in a semi-professional league.